The highly anticipated MAC Simpsons collection is finally on it’s way to MAC stores and counters everywhere. Recently, avid fans of The Simpsons have caused quite a stir by circulating images of ad campaigns for the long-awaited line. Like most other MAC limited edition collections, the latest line will be packaged in specialty containers and the pressed powder even has Marge Simpson’s silhouette etched into it. Although this collection is geared to all Simpson’s fans, it pays special homage to Marge, with colors and names that were inspired by the blue-haired cartoon herself. 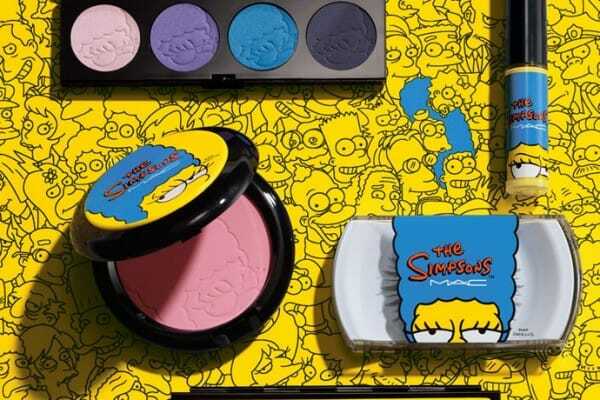 The Simpsons MAC collection will be comprised of 10 fun and playful products which will include lip glosses, false eyelashes, nail stickers, an eyeshadow palette, and a couple blushes, according to Entertainment Weekly. The line is packed with bright shades that are ideal for summer months. The line will not be released in stores and counters until the 4th of September 2014 but will be launched and sold online as of 28th of August 2014. However, if you just can’t wait until the end of August, a limited one day pre-sale of the collection will be held at Comic-Con on the 26th of July 2014. According to CBS News, MAC cosmetics created this line especially to celebrate the 25th anniversary of the Comic-Con convention. Those that attend the show will have exclusive access to a Marge-inspired makeover using the new collection. In the official press release for this collection, “Marge” claims that “They’re all so great, but I must say that Lisa’s Spikes really works well with my skin tone and of course, Beehive Blue complements my hair perfectly.” Despite the limited information that has been released about this line, if the buzz that has been swarming the beauty and comic industries are any indication of the line’s success, it’s going to fly off the shelves!